We know that it‘s quite difficult to have a good orientation and find everything straightaway in an unfamiliar/unknown city. That‘s why we are going to give you a quick overview of Erlangen and the campus, so you might not be one of the new students, who is getting lost on their way to the first lecture! 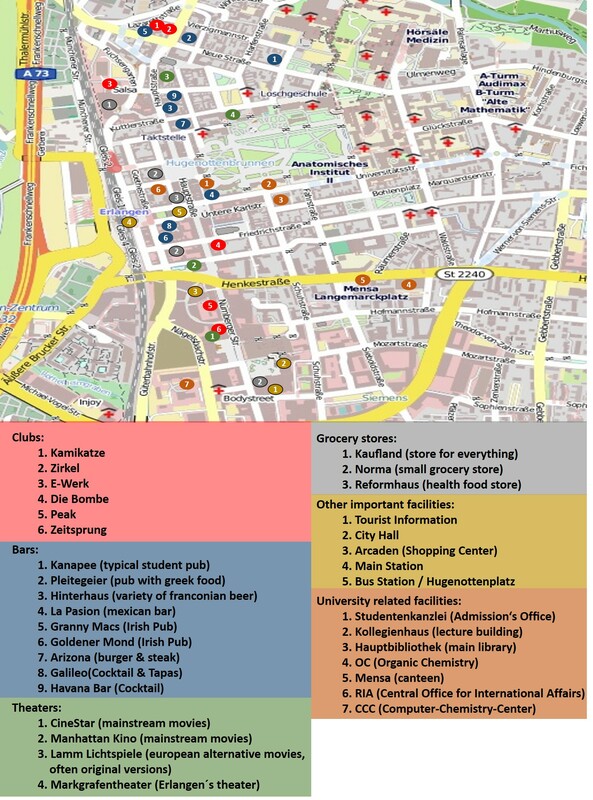 We will give you important information about the city center, the „Südgelände“, bars, clubs and leisure facilities and how to get there. 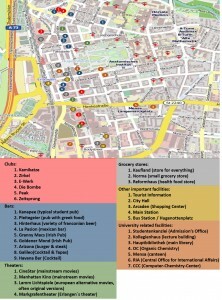 An interactive map of the FAU can be found here. We strongly recommend to buy a bike in Erlangen, everywhere are cycle ways and bicycle stands and you will never have a problem parking your bike somewhere. Another good way to get where you want is using the bus. The bus lines 280, 287 and 293 stop right in front of the AC-building. Just get of at „Technische Fakultät“ and you are there. Check out the website of the transport association for more information. You can even use the car. However, there is often the problem of getting a parking lot really close where you want to go.